There was a strange little creature that inhabited our home and our hearts for the past 12 years, who we bid farewell to with memories and tears. Our little wild cat, Zoe left us yesterday, for a place in heaven where she can frolic and play…and cuddle and slobber, purr and wiggle…and will surely make the angels giggle! Zoe loved her doggies, she was one of the pack. When she went on an adventure they’d have her back. 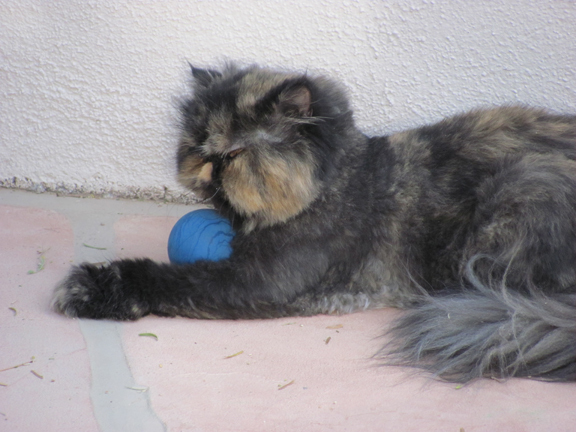 She loved to hang out on the porch and sit in the sun, or play with her ball….oh, so much fun! 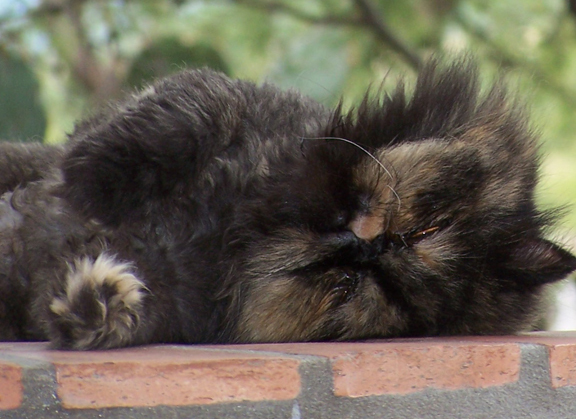 Part monkey, part dog and part purrrincess diva, she was a cat like not other, and had only one pet peeve(a). If her looks got scruffy and hairs to fluffy, she would pout and get ‘pissed’ and let us know when enough was enoughy! So off the the groomer she’d go to get pretty and then, once again, she’d be our good little kitty! 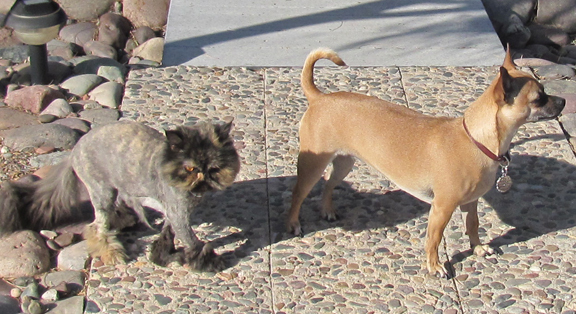 Zoe rocked her cropped look, so stylin’ with her mane!…In fact, her little lion ‘do’ became her claim to fame! 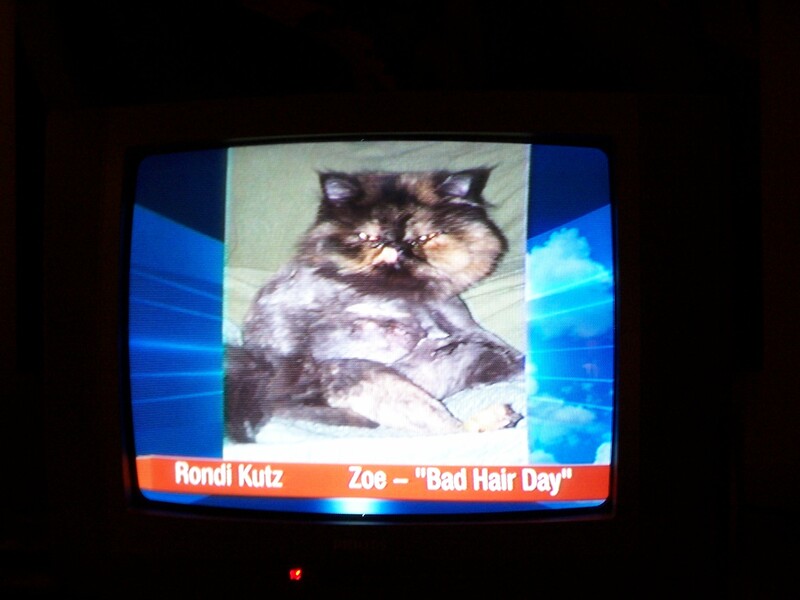 Although this pic that aired on the news without her happy face might lead you to believe she was slightly disgraced. But make no mistake, Zoe was happy and loved, and is purrrrhaps looking down right now and smiling at us from above! Zoe was 14 years old when she passed away yesterday from a bloodclot that burst in her lungs. Rest in Peace little lion cat! Sorry to hear your furry friend passed on, 14 yrs.? WOW!…….she looked like a little package of love. I’d be lost with out my Buford.